Are you doing B Com? 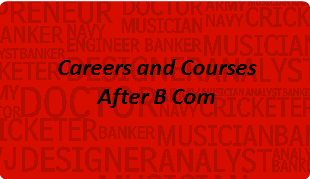 Have you done B Com and are wondering what career/ courses after B Com will be best for you then read on. In the last few years B Com has become one of the sought after course after 12th ( No wonder cutoffs in SRCC and Similar colleges are touching the roof ) and a large number of students opt for it even if they have not studied commerce and accounts in class 12th. While the decision to take B Com may be a good one for some, it may turn out to be another career mistake for others. But no worries there are many careers/ courses after B Com that are still open for you where you can utilize your natural talent and find success. Some of these will require higher education, clearing entrance and competitive exams and for some you may begin after getting a short duration course as well. · Chartered Accountant: CA is perhaps the number one choice of students opting for B Com. If you have a god aptitude combination for CA ( Check your aptitude by taking the test from this link ) then you can also prepare for CA. · Company secretary: Just like CA many students write the CS exams to become company secretary. · Business Manager: This is another very attractive career after B Com. With entrepreneurship fast emerging as a career option many students opt for MBA / PG Diploma in Management and some also opt for entrepreneurship courses. · Finance Manager / Financial Analyst: You can also go for specialized course in finance and can be a financial analyst. Apart from MBA finance one can try for CFA / CMA and other professional certifications and courses. · Actuary: If you are good in mathematics / statistics then you can consider becoming an actuary, which has perhaps the highest pay packages. · Lawyer : If you think that missed by not taking the 5 year integrated law course after 12th you can go for a good career in law after doing LLb after B Com some Top universities like Delhi University and Mumbai University offer 3 year LLB courses. · Banker : Banking is another lucrative field which is good for commerce graduates. You can join the banking sector after B Com by writing the Banking exams , you can also join after doing CA / Law / PG in economics etc. · Trader / Broker : You can also get certifications from NSE and BSE and get into stock trading where your B Com background will help you. · Journalist : Journalism is another career / course after B Com that is fast emerging and offers good options. You can go for PG Diploma in Journalism from Top Institutes like IIMC or can go or MA journalism from Jamia or can head to Xaviers Mumbai for Journalism / PR course. · Advertising Manager: If you are very creative and have good communication skills then advertising also offers promising career options after B Com. you can go for PG diploma in Advertising / market Research and related fields. · Economist: You can also become an economist by taking up PG in economics. · Designer: If you have a good creative artistic ability and don’t want to go for monotonous commerce / finance careers then you can become a designer and can opt for PG in Design course from sought after institutes like NID. · Travel and tourism manager: If the travel sector attracts you then you can take up specialized programs in travel tourism from institutes like ITTM Gwalior . · Sports Manager: If you are a sports lover but could not make it as a professional player then you can be close to your game and can become a sports manager / sports journalist after B Com. · College Teacher / School Teacher: You can opt for B Ed or can clear NET after PG to get into teaching profession. · IAS officer / Government jobs: If you an administrator and want to serve your country you can try for IAS / PCS and other government jobs after graduation. · Army Officer: For adventure lovers who love the uniform ..Army is another good option. You can write the CDS exam and become a Army officer. Well the list can go very long but if you are thinking that out of these careers / courses after B Com which one will be best suited for you, you can take help of our experts who can help you decide. To book an appointment with MapMyTalent experts you can call us at +91 9650 338 746 / 0124-4084211 .